What's not to love about a steakhouse-style chopped salad? 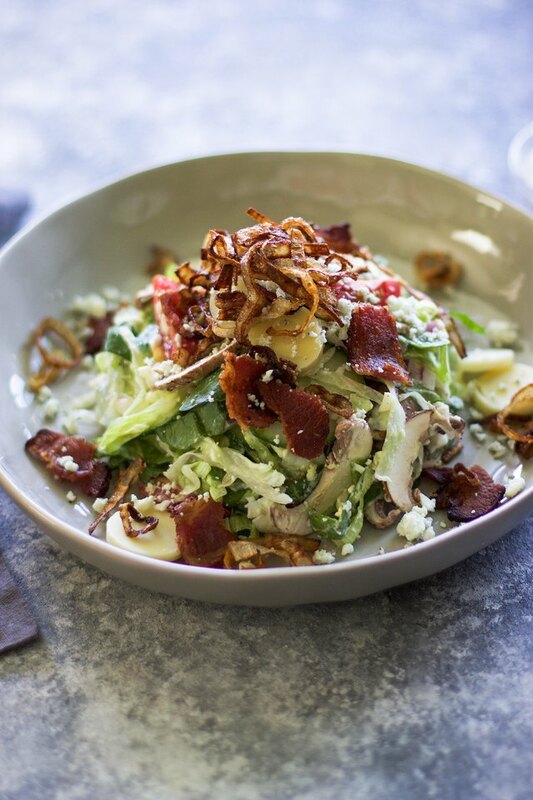 Crisp lettuce topped with fresh cucumbers and tomatoes, smothered in a creamy, tangy dressing, topped off with crunchy fried shallots, smoky bacon, and a whole lotta other good stuff? I've whipped up my favorite version of a steakhouse-style chopped salad that's easy for anyone to make right in their very own kitchen. 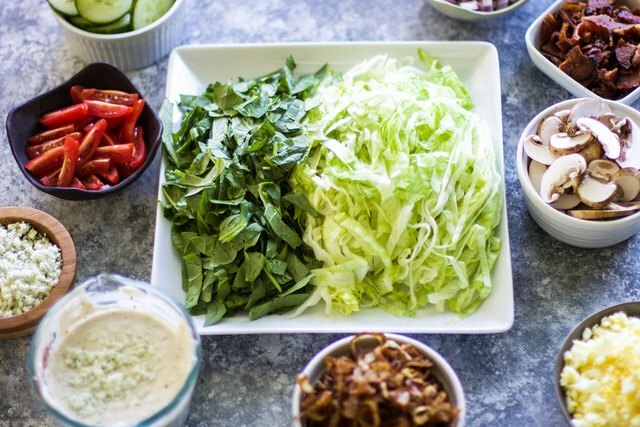 Plus, it can be adapted to your favorite steakhouse-style salad toppings, no problem! Pour the vegetable oil into the bottom of a large skillet or deep pan. Heat to about 325 degrees. Add half of the shallots at a time in one single layer to the oil and cook for about 5 to 8 minutes until golden brown. Make sure to stir the shallots every minute or so for even cooking. Drain the browned shallots onto a paper-lined plate to get rid of excess grease. You can also substitute store bought crispy onions if you prefer, but I highly recommend frying your own. If you don't have a thermometer to test the oil temperature, simple test the oil by placing a small shallot in the oil and listen for a sizzle. If it sizzles, you are good to go! Combine half of the blue cheese with the Greek yogurt, vinegar, Worcestershire sauce, steak seasoning, salt, and pepper in a bowl or mason jar and stir until combined. Chill until ready to use. If the dressing is too thick, simply thin out with more milk. 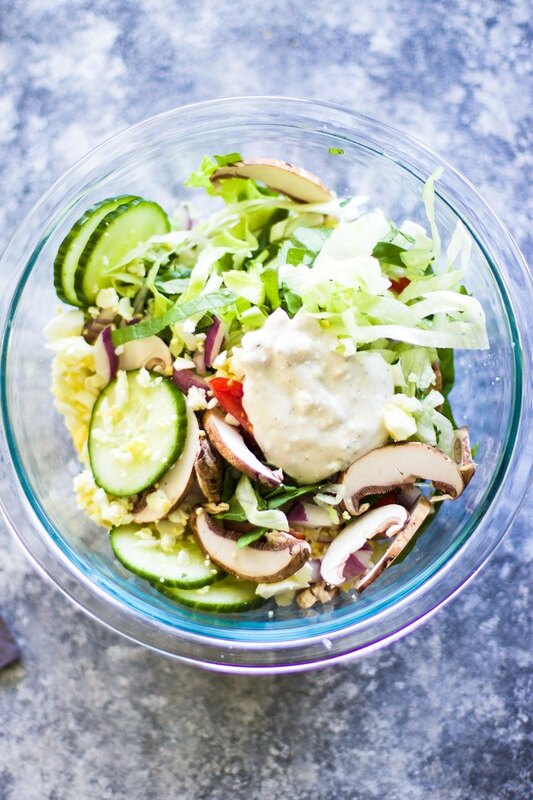 Toss together lettuce, spinach, cucumbers, tomatoes, onions, mushrooms, eggs, and desired amount of dressing (about 1 tablespoon per serving) in a large bowl until all ingredients are slightly coated with the dressing. 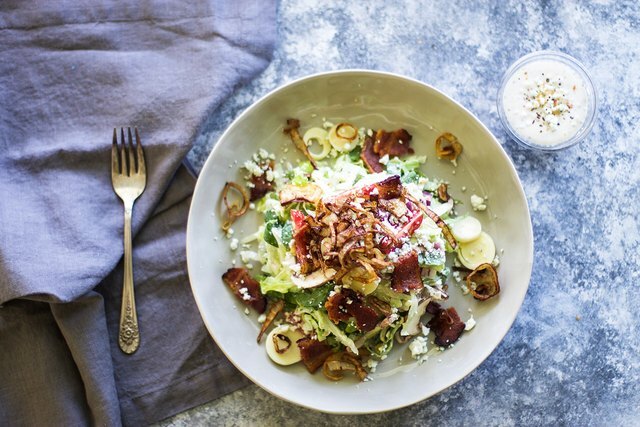 Before serving the salad, add chopped bacon, crispy shallots, the rest of the blue cheese crumbles, and hearts of palm. Serve immediately with more dressing at this time if desired. 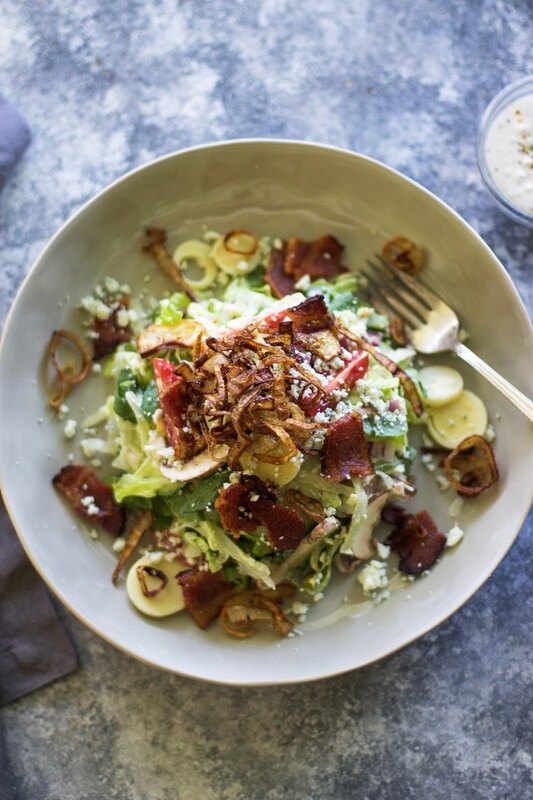 This salad is a stunner and tastes amazing too! It could easily be served as a meal on it's own, but you might as well cook up a steak to pair with it since, it is, after all a steakhouse-style salad. The two pair perfectly together and you will love knowing that you don't have to leave your house to satisfy that craving. I can't wait for you to give it a try in your own kitchen!